Before your car was built, an order for it was placed with Chrysler. It may have been placed by an individual, by a dealer or out of a sales bank. As soon as the order was placed, a Build Record was generated. 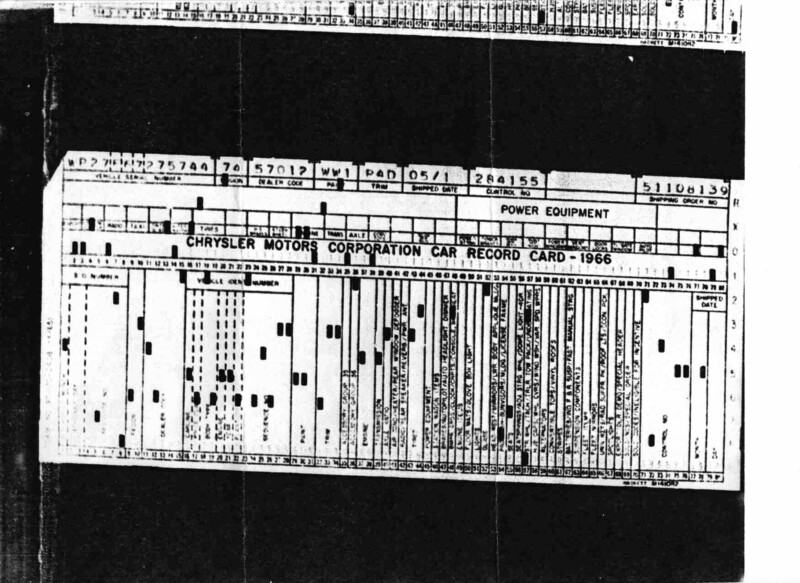 From the '50s or '60s onward, this was an IBM computer punchcard. The Build Record was the first piece of your car to be manufactured. It contains information about what type of car was to be built, the body style, paint, options, etc. From the Build Record, several Broadcast Sheets were generated and from that a Fender Tag was stamped. As soon as the frame was jigged and the order was released for production (Scheduled Production Date), the Fender Tag and a large, blue-letterd broadcast sheet were attached to the frame and the car started its journey down the assembly line. At each shop along the assembly line, another Broadcast Sheet was printed, possibly as many as a dozen or so. Sometimes the Broadcast Sheets were left in the cars, sometimes not. And sometimes a Build Record was left in the car, so be sure to look for any scraps of paper if you disassemble your car. When the dealer sold the car, the Zone Office generated a Build Record on their computer. That's how the original warranty was activated. Then the Build Record was sent back to Chrysler in Michigan where it was copied to microfilm. Hopefully, your Build Record is still on file in Detroit. Unfortunately, many are not. Some may still exist, but have not yet been organized and thus can't be found. It seems that most prior to 1968 are on file. For example, I was unable to obtain a Build Record for my 1970 GTX, but Chrysler did have the Build Record for my 1966 Coronet (see below), my '62 Max Wedge and my '67 Police Fury. They sent several copies of the microfilm of the Build Records. The quality is not great, but they sent enough copies that all of the option codes are legible. They also sent me information about where the cars were originally sold and what some of the options were. Very cool info! Be sure to include the VIN of the car in question and proof of ownership (a copy of the title, for example), a self-addressed stamped envelope and a check made payable to Chrysler LLC. If your build record is not on file, they will return your check. As of April 2002, the cost is $45 per VIN requested. (Note: The price may vary from $25 to $45 as of 2010; please check the Chrysler Historical website for current pricing.) In a week or so you will have a valuable piece of your car's documentation. And remember, the folks working on this project are volunteers; please help them out any way you can. Click here to see an example of a Build Record.